As I mentioned early, gold has made a tremendous run lately. The main force behind the gold rally is the deterioration of economies around world. Despite the passage of the $789 billion economic stimulus package over the weekend, gold price keeps climbing up after the holiday. Currently spot gold is traded at $967 an ounce, up more than $10 from last Friday’s close, breaking the key $950/ounce level. That’s the seven-month high for gold, while major stock benchmarks are likely to test the November lows amid jitters in the financial sector. Even though there are predictions that gold could back after the stimulus plan became a law, that didn’t happen. In contrasts, investors are increasing their holdings of gold as a safe heaven to preserve their wealth as the stock market keeps declining. 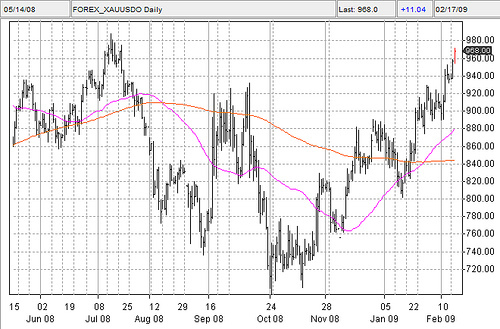 Right now, gold is trading well above its 50- and 200-day moving averages, a clear indication of the uptrend of gold. And investors’ appetite for physical gold, such as bars and coins, has driven up share prices of exchange-traded funds (ETFs) specializing in precious metal as well. Take a look at SPDR Gold Trust Shares (GLD), for instance, the world’s largest gold-backed ETF. GLD gained 3% in 2008 and 6.9% so far in 2009. The reason investors are also chasing GLD is that it offers investors an easy way to invest in the bullion without having to hold the metal themselves (you will have a lot more things to consider, such as storage and insurance, if you want to hold physical gold yourself). If you invest in GLD instead, your investment will reflect directly the price of gold because GLD’s share price is determined based on 1/10th of an ounce of gold. SPDR Gold Trust buys and stores physical gold to back GLD prices. 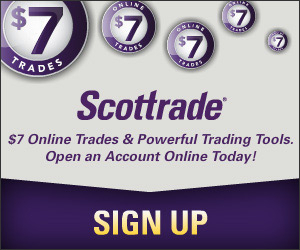 In fact by tracking holdings of SPDR Gold Trust, you can get a sense of the demand for gold. Currently holding 985.86 tones of gold, which is a record level for GLD, the demands are strong. Gold was a screaming technical buy once it broke the upside of the pennant. We’ve got a very strong chance of testing the $1000 highs again.